Ricardo Reyes, 41, shows hardcourt stars he’s got game. Filipino-American busboy Ricardo Reyes proved to be the David to five NBA Goliaths in basketball shootouts aired on Jimmy Kimmel Live. In June last year, LeBron James, Kobe Bryant, Lamar Odom, Charles Barkley and Carmelo Anthony all bowed down to Reyes’ Pop-A-Shot prowess. 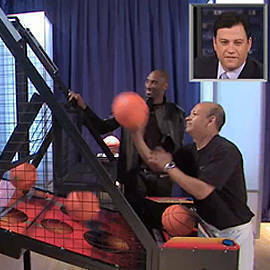 Reyes outscored each of them in a 30-second one-on-one match on the electronic basketball game, with Bryant coming the closest at 58 points to Reyes’ 82. Reyes, 5’7 tall, lost all tip-offs to the towering players but reduced them to astounded onlookers when he coolly made shot after shot. Some players attempted to faze him-Bryant even swiped a ball away-but he remained a shooting machine. At the end of the shootout series, he drove off with a 2011 Ford Mustang and took home five trophies from Kimmel. Reyes told ESPN he practices whenever he’s on break at Barney’s Beanery in Hollywood, California. According to PhilStar.com, he played every night after closing hours. His fixation with the game, which he spent his tips on, has led to arguments with his wife. But after he got the Mustang from Kimmel, he said, "When she sees my car, I say, okay, there is the money." According to the website of Barney’s Beanery-where Reyes has his own page-he continues to work full-time at the restaurant-bar but may be contacted for bookings.